Oh, Bali. Despite its pristine beaches, endless rice fields, and progressive tourism, there are amazing Bali experiences of a cultural nature, like this one. We spent a month living in Bali, and one day we got the opportunity to travel around with our friend Helen Suk, photographer/blogger. She hired a local Balinese photographer/ guide to take us around the island for the day to capture some of its incredible culture and scenery in film and video. 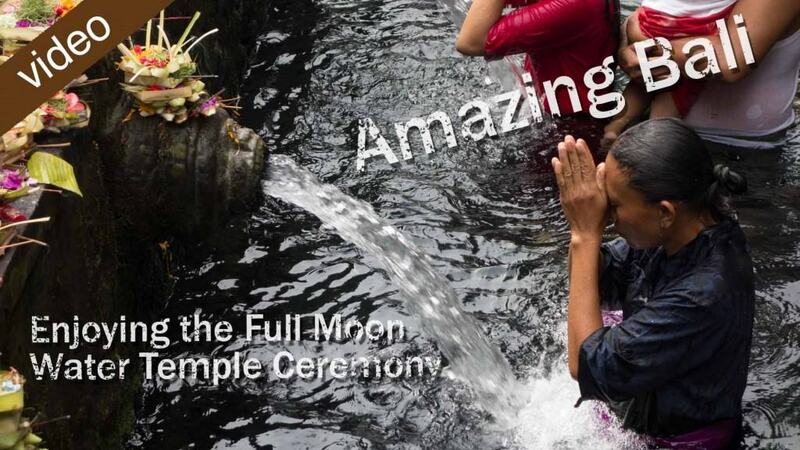 One thing we couldn’t miss was the Full Moon ceremony at the Bali Water temple. We spent a month living in Bali searching for local activities like fishing with a local man for the day or witnessing cultural events. Our first stop this day was the Tirta Empul temple, located 20km outside of Ubud. Tirta Empul, meaning “Holy Spring” in Indonesian, is one of the most important Hindu temples on the island. Fortunately, we were there on the day of the full moon, a very special day for ceremonies and festivities. The Balinese believe that during the full moon, gods descend to the earth and give their blessings. In turn, they honor the gods with offerings of food, fruit, and flowers at the main temple. The Balinese pray and blessed by various rituals using holy water, incense smoke, flower petals and rice by the Hindu priests. The important part of this temple is the famous holy spring; freshwater originating from the temple pond, that is used for purifying the mind and body. Families bathe in the pool of 15 fountains and allow the waters to wash over them between 4 to 13 times. This event is one of our favorite parts of travel, to watch, learn, understand and be inspired by the world different from our own. Looking for more to do in Ubud? Check out: What to do in Ubud, you can find it all here. To book a tour around the island of Bali, we really enjoyed our day with Dean-Bali Dude. For more local and cultural activities on the island of Bali,includes videos and resources. Traveling around Indonesia? Ccheck out this super useful Indonesia travel guide.